And that, in a nutshell, sums up the positive attitude of Cobblers assistant manager Dean Austin. The former Watford, Reading, Southend United and Crystal Palace coach admits he is ‘well travelled’ in the football world. As well as a host of coaching stints, Austin is a former Tottenham Hotspur, Palace and Southend player with more than 500 senior appearances to his name. There is nothing in football that surprises him, and very little that gets him down. So while the Cobblers’ current struggles against relegation are far from ideal, Austin is relishing, and enjoying, the challenge. And he is also enjoying his working relationship with Town boss Jimmy Floyd Hasselbaink, with the pair taking over at Sixfields in early September following the sacking of Justin Edinburgh. “Jimmy is a really good guy, he is extremely passionate and extremely focused,” said Austin when asked about the Town boss. “Listen, we all get frustrated at times when results aren’t going quite as we want them to go, but that is the nature of the beast. Despite a more encouraging performance, last weekend’s 0-0 draw with Oxford threw up some rough moments, with plenty of boos from sections of the supporters, which were mainly aimed at Hasselbaink and his decision to take off Gboly Ariyibi. An annoyed Hasselbaink explained afterwards that the player was fatigued, and questioned the negativity from some supporters, but Austin revealed that it has all been forgotten about. “On Monday things were very upbeat,” he said. “We felt we had a good performance, and we felt we should have scored two or three goals in the first half. “Obviously, in the end you come off and they have had a little rally at the end of the game. “We chased things a little bit, and changed it because we wanted the three points. “They were happy to come for the draw, but then the game opens up and becomes a bit of a game of basketball. “So you end up coming off thinking ‘actually, we are pleased with a draw in the end’ and take the positive of a clean sheet, because we’ve not had too many of them. “For me, the glass is always half full, and you have to take the positives from every situation. Slowly and surely, Austin and Hasselbaink are doing the job they were employed to do in getting the team clear of the relegation zone, although there is still plenty to be done. 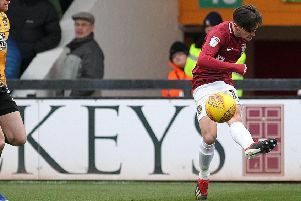 They had never worked together before joining up at Sixfields, but Austin feels they have hit it off as a partnership, and said:”We look at one game at a time, and look at winning the next game. “When we first came in we didn’t have a point and things were not very good, and you look at batches of games and say ‘right, how many points can we take from these’. “Now we have got to the situation where we have got a lot of business done in January, we have upgraded a lot of players, and we have had some positive results. “We have had some setbacks along the way, but that is normal and is always going to happen when you are working through a process as we are at the minute. The Cobblers’ scheduled clash at Blackpool on Saturday fell victim to the big freeze engulfing Britain, with the Seasiders postponing the game following a Friday morning pitch inspection. It means Town’s players will have had two weeks without any action before their next encounter, at Bristol Rovers next weekend.